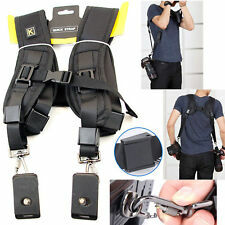 GoPro Chest Strap. Will Fit GoPro 1 2 3 3 & Hero. Clip On Adjustable Strap. •Built for speed, for when timing is everything. Design for professionals and easily carried with two DSLRs. Secure locking system and easy to release;. Ideal for outdoor photography! Constructed out of durable high tensile strength nylon webbing with elastic band and buckle. Fine, strong, abrasion resistance, will not grind machine. Great for Travel / Outdoor Photographers. Designed for active photographers, the gray CCS G3 Harness-1 from Cotton Carrier helps to evenly distribute the weight of a camera with a long lens. This arrangement keeps the camera at the ready for making the most of spontaneous photographic opportunities, while also keeping hands free, equipment safer from grab-and-go theft, and reducing unwanted camera movement. Photographers will appreciate the one-size-fits-all approach, comprised of adjustable shoulder straps and a quick release waist belt. Also provided is a BlackRapid FR-5 FastenR Breathe for every carabiner. BlackRapid Double Slim Breathe Strap. JZS CC-20 Microfiber Cleaning Cloth. One strap can be worn across a right-handed user's body, draped from the left shoulder to the right hip, while the other can be worn across a left-handed user's body, draped from the right shoulder to the left hip. 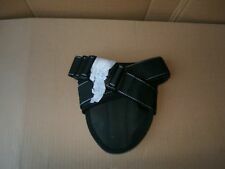 Wanderer side holster. Cotton Carrier's new mount fits all binoculars, carries them horizontally and allows for tripod mounting. A quick clip is now used so it's quieter for those situations where silence is required. TREKKING SAFARI CLASSIC HARNESS SYSTEM. The Safari can comfortably carry a reflex and a pair of binoculars. United Kingdom Rest of World. Trekking Safari Sport 12310. The Safari Sport can comfortably carry a DSLR and a pair of binoculars. SAFARI Sport : Relieve your neck strain ! For SMALLER People. 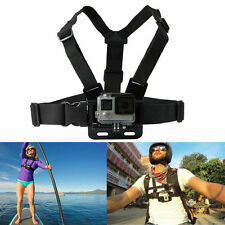 Look no further we have the ultimate GoPro chest strap for you. That can capture every bit of your adventure from your point of view without you having to worry about holding it. 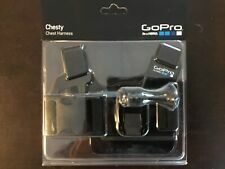 GoPro Chest Mount COMPATIBLE WITH ALL HERO MODELS: HERO 6, 5, 4, 3 , 3, 2, and Hero Session 5 4. Chest Strap Mount Head Strap Mount Wrist Strap Mount. Wrist Strap Mount. 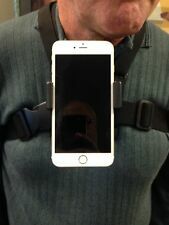 Chest Strap Mount. 1 x Wrist Strap Mount. Head Strap Mount. Colour: Black. 1 x Chest Strap Mount. 1 x Head Strap Mount. Designed for active photographers, the gray CCS G3 Harness-2 from Cotton Carrier helps to evenly distribute the weight of two cameras with attached lenses. This arrangement keeps the cameras at the ready for making the most of spontaneous photographic opportunities, while also keeping hands free, equipment safer from grab-and-go theft, and reducing unwanted camera movement. Photographers will appreciate the one-size-fits-all approach, comprised of adjustable shoulder straps and a quick release waist belt. Two stash pockets for memory cards or batteries and a large exterior pocket provide storage for accessories. Trekking Safari Pro Harness - Camo. Camouflage version of the Safari Pro Plus that ideally distributes the weight across the shoulders and back. SAFARI Pro: Relieve your neck strain ! Hand cut, crafted and dyed in the Kent by myself using only the finest leather, fixings, dye and finishes. Colour may vary slightly. Heavy duty harness for professionals and amateurs alike, ideal for wedding or event photographers. AKASO EK7000 AKASO EK5000. Chest Strap Mount Head Strap Mount Wrist Strap Mount. Wrist Strap Mount. Chest Strap Mount. 1 x Wrist Strap Mount. Head Strap Mount. 1 x Chest Strap Mount. 1 x Head Strap Mount. Colour may vary slightly. Hand cut, crafted and dyed in the Kent by myself using only the finest leather, fixings, dye and finishes. Model is 5ft 2. These are made by Photographers for Photographers. As the DUAL HARNESS™ uses the 3/8" connectors, your gear remains safely in the upright position at your sides. Since the DUAL HARNESS™ incorporates OP/TECH USA's 3/8" connectors, your tripod mount is available to use for brackets and other adaptors. The harness is made in the Cobra Weave with King Cobra shoulder section for added protection on the shoulder. An aluminium carabiner is attached. 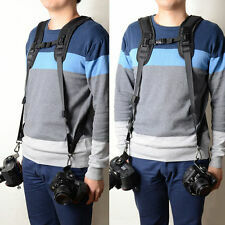 This 'floating' section moves easily of the main strap making it very convenient for taking pictures while on the move. Non-slip material on both sides of strap. Poly spun strap. N-45, 25, 17, 11, 5059, 5055, 5057. There might be others, just look and see if the buckles match. These buckles are for users of the Trekking harnesses and other compatible devices. Leather : Full Grain, premium Italian Leather (the best leather available in Australia from local leather supplier). -D ring and Buckle : Heavy Duty (used in fishing industry). - It has everything you need. Also provided is a BlackRapid FR-5 FastenR Breathe for every carabiner. BlackRapid Double Breathe Strap. JZS CC-20 Microfiber Cleaning Cloth. One strap can be worn across a right-handed user's body, draped from the left shoulder to the right hip, while the other can be worn across a left-handed user's body, draped from the right shoulder to the left hip. If you prefer the security of a bag whilst trekking, the Kangaroo bags can be clipped onto your harness and so can the laptop station ideal for surveyors etc. The Safari Sport is ideal for birders who want to carry the binoculars in a secure manner on their front, in which case the bins can be fitted with the buckles.